Prep. Time: 10 min. | Cooking Time: n/a min. Wash and peel the mangoes. Cut them into small pieces and place them in a high-speed blender until you obtain a smooth consistency. Open the yogurts and put them in a large serving bowl. With a spoon, spread the yogurt around the bowl so it looks even. 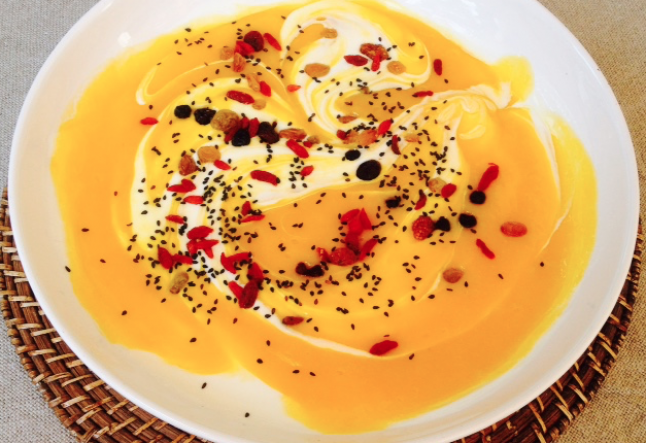 Put the mango sauce over the yogurt and drizzle the goji berries, raisins and finally the sesame seeds. Serve cold in individual dessert bowls.